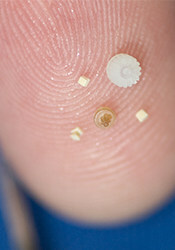 There is no standard micro mold project. Every request from our clients is its own unique challenge. Our customers are used to pushing limits and demanding smaller. The components and parts we manufacture for our clients are entirely custom using designs from world-class engineers and can be classified into three major micro mold classifications. Micro molding capabilities are the essence of what we do at Accumold. We started our company on this exacting manufacturing process and it remains at the heart of our operation today. 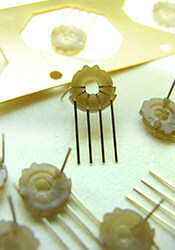 Parts made with our Micro Mold® process range in size from just microns to a half inch (13 mm). These components often have complex geometry and very tight tolerances—with no margin for error. Small parts are slightly larger than those within micro mold classifications: from a half inch to about 3 1/2 inches (9 cm) in diameter and made from a one-ounce shot of material. Even so, they require the same degree of precision and quality during production. 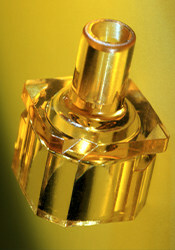 Many have micron tolerances, and they can have micro-sized features measured in microns. Accumold can mold plastic on and around various types of metals, plastics, fabrics, foils and complex components without damaging or warping the structure in any way. Some of these processes produce complete parts, while others are ready for further processing by our customers or their contract manufacturers. In many cases, high-speed handling can be added to these processes to save resources.